3 UP, 3 DOWN “Affinity of Form: Photographs by Stan Lipsey” April 29-May 26 KANEKO, 1111 Jones St. Opening reception Friday, April 29 at 1-8 p.m. thekaneko.org You probably saw by now that we’re running a retrospective this week of the events that led to the Omaha Sun’s 1973 Pulitzer Prize for Local Investigative Specialized Reporting, a cover story that uncovered the large financial resources of beloved local institution Boys Town — figures that reached into the hundreds of millions and shocked the general public. The article received national attention and eventually led to not only the Pulitzer but to major reforms in Boys Town’s solicitation of money from the public and the usage thereof. 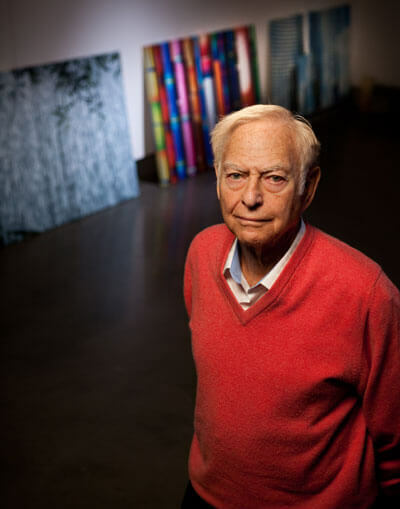 One of the heroes of the story-behind-the-story, former Sun publisher Stan Lipsey, will be back in town for the annual Berkshire convention (Warren Buffett was the owner of the Sun at the time of the Boys Town story) and to celebrate the opening of his “Affinity of Form” exhibit at KANEKO. “Affinity of Form” features 61 images and large-scale photographs that Lipsey regards as the culmination of one of his lifelong passions. His other lifelong passion, journalism, is still going well for him, too. That Pulitzer opened doors for many on that Sun staff; for Lipsey, it led him to Buffalo, N.Y., as the publisher of The Buffalo News , where he has worked since moving there in 1980. We caught up with Lipsey in advance of his arrival in Omaha to talk about Buffalo, his exhibit and that Pulitzer Prize. For someone like you who lived here but now comes back at least once a year for Berkshire, you’ve had the unique perspective of seeing a gradual but definite change to Omaha. Oh yeah. It’s just a booming thing and such a contrast to Buffalo. Buffalo is the third-poorest city in the country and when I come to Omaha and there’s always all these cranes and new housing developments. When I was a little kid my folks used to take me for a ride and if you got west of 72nd you were in farmland. Now, it’s different. But what I miss most is Omaha has got an attitude where the private sector gets up in the morning and tries to figure out what they’re going to do for Omaha. I’ve tried to foster that in Buffalo … one time I invited a bunch of people — people identified as private sector leaders — and I was surprised that they were just interested in their own business, and making money so they could retire in Florida. But what I remember about Omaha is people getting together and thinking, “What is the mission for Omaha?” Let’s talk briefly about your exhibit. What can people expect? There’s 60 pieces. Some of the pieces are very large — landscapes that are 11-feet long. Those are things that were shot on film, and to think that comes out of a 35mm negative, that will be something remarkable to see. What’s happened since I did the book is I have gotten to making these photographs very large and getting them on canvas. I just think they’re very impressive to see them so big and on canvas. It’s a cool deal. We’re running a piece on the Omaha Sun’s Pulitzer Prize-winning expose from the early ’70s this week, so I’ve got to ask about your role in that. What made that staff of guys so special, and have you done anything since that compares? In terms of an accomplishment, it’s probably the best. What could be more significant for a career in journalism than that? The staff did a good job; take a guy like Doug Smith, who was writing our entertainment features, did as good a job as anybody. But the person that made the Pulitzer was Warren, in two respects. He was the first to give us the tip that they had all this money and weren’t doing anything with it. And then he was the one that figured out Boys Town had probably filed a 990. He said, “Go get it.” And because of his financial expertise — he was the one that was able to analyze it.